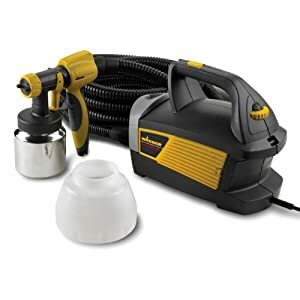 Best Automotive Paint Gun for Beginners Review: Only Top in 2019! 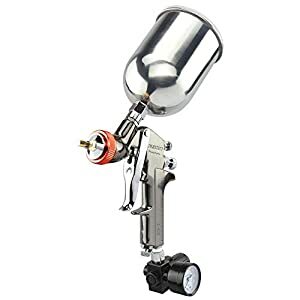 Top-Rated Spray Paint Guns for Beginners You Were Looking For! Painting cars, vans, and bikes (as well as homes and fences) is a very precise business. It is the combination of artwork and commercial painting and where the finish is what counts. Even when painting one color it is important to be accurate and go in for detail, and that is where the tools of the trade come into play to complement the painter’s experience. “Atomization” this is the key word to remember, it’s not just about a steady hand and an eye for detail, it’s about the level of atomization your tool can reach, and atomization is what will give you that glass like finish. 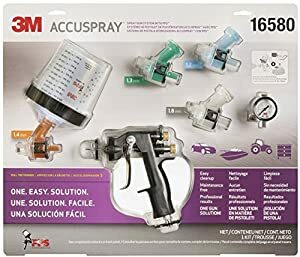 There are a wide variety of spray guns reviewed here, form the most basic, which are great starter tools, to the high-end tools for professionals, that should be sued by a beginner as well. A beginner has to understand the difference in tools to be able to appreciate, learn and produce the best end results. If it’s a combination of heavy-duty work and precision with nice atomization than this is the unit that will suit you. It has a rust-resistant stainless-steel nozzle with solid brass cap and comes with the classic gravity fluid feed design. The three adjustable valve knobs give you the basic controls that a beginner needs to develop initial confidence and skills. It has a color-coded 1.7mm nozzle and comes with a 600cc (20.3 fl. oz) aluminum cup with lid, air regulator with gauge, a cleaning brush, and a tool wrench. This model’s operating pressure is 40 PSI, and it’s working pressure is 10 PSI. The average air consumption for this model is around 4.5 CFM. The price is basic, budget-friendly and well worth considering when taking your first steps into the world of auto-work painting. This model’s operating pressure is 40 PSI, and it’s working pressure is 29 PSI. The average air consumption for this model is around 4.5 CFM. This is a more costly basic model, but is very simple to use and provides an excellent base to which to improve your overall spray controls. The TCP 3-gun set is perfect for beginners as well as intermediate painters. 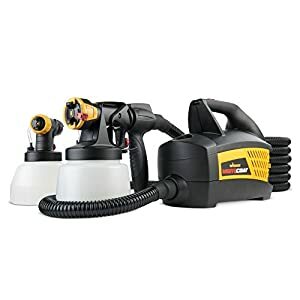 It comes with three separate guns and three nozzle sizes, enabling you to control your spray and colors in a job without changing and cleaning your gun between each detail. The nozzle sizes include a 1.4mm piece best suited for light to medium viscosity liquids, a 1.8mm piece for medium to heavy viscosity liquids and a 1.00mm piece for detail and touchups. The two big guns come with its own 1L aluminum cup and lid, and the smaller gun (1.0mm) comes with a 150cc Stainless Steel cup and lid. The set includes one Locking Air Pressure Regulator, an Inline Mini Moisture Filter and a cleaning kit, a spanner wrench, hex wrench, brush and 2 filters. This model operates at pressures between 29 to 50PSI. Its air consumption is between 3.5 to 7.1CFM. These guns are exceptionally budget friendly and for a beginner having three different nozzle diameters to try, test and play around with, is a great opportunity. 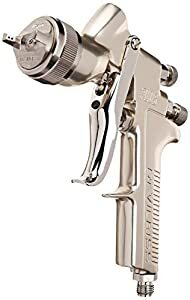 This is the Lamborghini of spray paint guns; it is an Iwata which makes it top of the model brands as well as expensive. 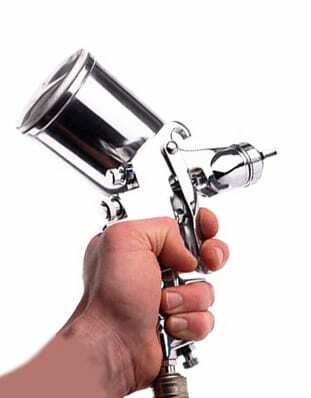 It’s a great professional spray gun that in the hands of a beginner will give them the chance to experience high-quality painting. However, the price is something to consider, and this gun is usually found in a professional painter’s toolset. Air consumption is 9.5CFM, Atomization is set at 16PSI, and fluid output is 110/mil.min. with a pattern width of 280mm. 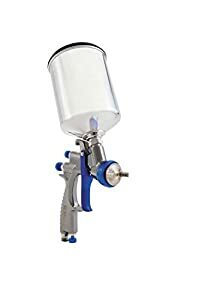 This is a high-performance model; it provides quality atomization which is very good for a serious beginner seeking paint spray as a profession. Just remember, the price is about four to ten times as much as any other basic model. This is a great two-gun system that works well with all fluids. One gun comes with a 1.3mm nozzle and an extra option to change to a 1.5mm nozzle. The second gun is a 1.8mm nozzle piece. The 1.3mm nozzle gun comes with a 600cc metal cup and works best at 30 PSI, the inlet pressure is 10 PSI, and the air cap pressure is 13CFM. You can change the tip to a 1.5mm single stage piece suitable for light to medium viscosity liquids. The 1.8mm nozzle gun comes with a 600cc metal cup and works best at 30 PSI, the inlet pressure is 10 PSI, and the air cap pressure is 13CFM. This gun is suitable for medium to high viscosity fluids. This set is priced conveniently for an easy budget and is highly recommended for beginner users. 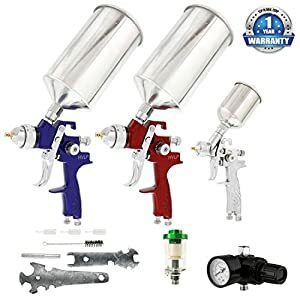 The Neiko spray gun with 2.00mm gun nozzle is perfect for beginners in the automotive painting industry as well as to use around the house for large paint jobs. The 2.00mm nozzle is for large surface coverage and will enable any beginner to start off learning the basics with ease. This model’s operating pressure is 40PSI, and the working pressure is 10PSI, the average air consumption rate is 4.5CFM. 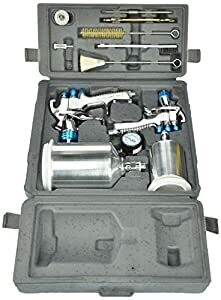 It comes with a stainless-steel nozzle tip and a 600cc aluminum cup with lid, as well as an air gauge with regulator and tool wrench and cleaning brush. 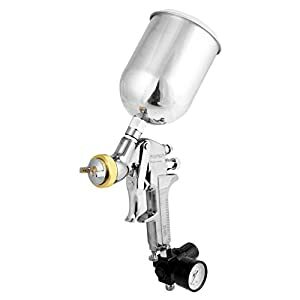 Its price is convenient, and this is what makes this gun highly attractive to any beginner or DIY spray painter. This is a great DIY gun and large surface painter but is a professional undercoat painting tool. It has a plastic body and nozzle, so it does not seek accuracy, it is a gun for large and fast surface coverage. This model has a low overspray and provides you with simple adjustable controls. The iSpray Nozzle and cup attachment let you work continuously to complete a thick textured finish, and it comes with a 39’ hose. The price of this unit is reasonable, and you have to consider that this is designed for a simple, fast large surface textured coating, and due to this fact, this gun is a great starter and learning gun for beginners. 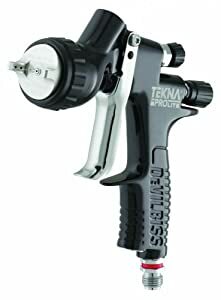 The TEKNA ProLite spray gun comes without cups and has a disposable cup adapter. This allows you to change materials fast and with ease. This model comes with TE10 and TE20 air caps and includes three tips, a 1.2, 1.3 and 1.4 fluid tip. This gun was designed to work in multiple climates; this means it can be used successfully in all seasons, such as minus degrees in winter to plus 80’s in the summer. The Tekna is modular in design, so it comes with an assortment of parts that are interchangeable and affords the user a lot of flexibility and versatility. This model is expensive, its modularity and special design make this a professionally priced piece and is great in the hands of a beginner living in a more extreme weather environment. The DeVilbiss PLUS® High-Efficiency Gravity Feed Gun with cup comes with 3 tips, a 1.2mm, 1.3mm and a 1.4mm tip and a 900cc aluminum cup with lid. This model includes an air adjusting valve with gauge, a Fluid filter, and a gun hook. This gun gives you super atomization, creating glass-like finishes while reducing overspray. This is a non-HVLP gun but has a higher air cap pressure than HVLP guns. It also produces a material transfer rate of 65%. The price is in comparison to its quality; this is a professional gun, but well worth the investment for beginners that are seeking to hone up their gloss glass finishes. 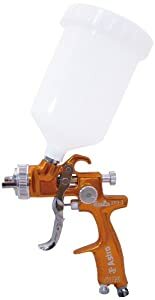 The Critter Spray Products 22032 118SG Siphon Gun was designed and developed for beginners. This is the one you want to buy and use anywhere, on your car, your home, and your fences. It’s a great tool that teaches you the basics of spray painting without all the bells, whistles and professional jargon. This model sprays a 1/2- to 2-1/2-inch circular pattern, and the kit requires 3 CFM at 90 PSI compressed air source, preferably a ¾HP air compressor. Let’s just state that this models price and performance are both great. This is a great two-gun system that works well with all fluids. One gun comes with a 1.0mm nozzle, the second gun has a 1.3mm nozzle, and the third gun has a 1.8mm nozzle piece. The 1.0mm nozzle gun uses the 250cc metal cup and works best at 30 PSI, the inlet pressure is 10 PSI, and the air cap pressure is 13CFM. The 1.3mm nozzle uses either the 250cc or the 600cc metal cup and works best at 30 PSI, the inlet pressure is 10 PSI, and the air cap pressure is 13CFM. The 1.8mm nozzle gun uses the 600cc metal cup and works best at 30 PSI, the inlet pressure is 10 PSI, and the air cap pressure is 13CFM. This gun is suitable for medium to high viscosity fluids. This gun kit comes with an air regulator with gauge, a gun cleaning brush set with a wrench and a carry case. This three-gun set has a nice price tag when you consider the brand and the quality you are paying for. 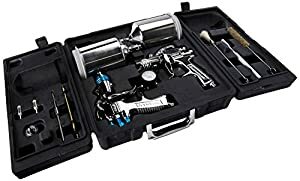 Essentially, if you are a beginner seeking to work all surfaces and liquids, this is the gun set to get, since it will stay with you even when you become a professional with experience. 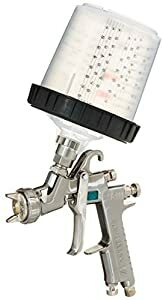 This is the FX3000 1.0 mm HVLP Gravity Feed Spray Gun, like the 1.3mm model (mentioned above) the basic details are the same, only the nozzle is different. This model is budget friendly but on the heavier side of the friendliness. This is a 1.0mm model, so its tuned for finer artwork, something all beginners need to hone up after clearing their basic spray painting skills. The Wagner Control Spray Max comes with a variable air pressure control, a metal spray gun, and a two-stage turbine to make it easier to paint large surfaces including walls and surfaces with thick viscosity fluids. This model comes with a 20’ hose, making it easy to manipulate during long jobs. It also provides 3 different spray patterns and has an adjustable flow control switch. It works with a variable air pressure range between 1.50 to 2.63PSI. In terms of price, this is an exceptional model to start with and well worth having in your arsenal for all kinds for large surface jobs. The 3M Accuspray One Spray Gun System with Standard PPS comes with three nozzles, so you get a full range of versatile coatings to choose from. It is made of a lightweight composite material and is very easy to clean and maintain. The nozzle diameters are 1.4 mm, 1.8 mm and 2.0 mm providing good atomization with different mediums. Its price is average, but this gun is well worth the investment since it does provide a lot of versatility and is especially easy to clean and maintain. The Astro Pneumatic EVOT14 EuroPro Forged EVO-T Spray Gun comes with a plastic cup and lid, but its main feature is its forged aluminum body that is both lightweight but long lasting and corrosion resistant. 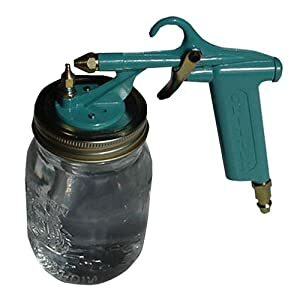 This durable and rigid spray gun will last a long time. The nozzle is a 1.4mm stainless steel tip and comes with an “Air Curtain” feature that reduces overspray and residual pollution. This model comes with a 600cc nylon cup with an integrated “drip check” device that prevents spillage from the vent hole. Best Gas Pipe – Buyers Guide! Fine comparison for people just starting to look into the industry. I would like to see more info on LVLP guns as well.